When Did Your State Adopt Its Gas Tax? 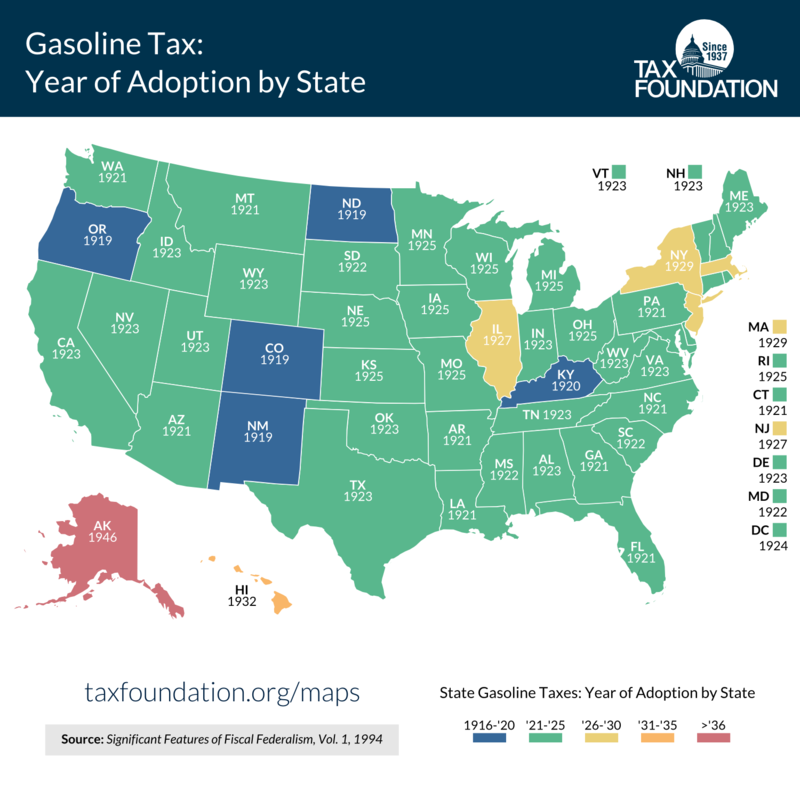 This week’s map shows when each state adopted its gasoline excise tax. States began to adopt motor fuels taxes in 1919 (Oregon was first in February of 1919) and, by 1929, every state in the union at the time had one (Hawaii and Alaska implemented their taxes several years later, but prior to gaining statehood). Unlike many other major taxes, gasoline taxes spread with surprising speed and uniformity, covering the entire nation within a decade. The last holdouts in New York and Massachusetts passed gas taxes in 1929. The early 1900s saw a rapid rise in automobile use and ownership. The phrase “traffic jam” entered our modern lexicon in 1913. According to the US Department of Energy’s Transportation Energy Data Book, the real retail price of a new car fell nearly 60 percent from 1913 to 1937, while from 1913 to its first peak in 1929, car ownership per 1,000 people rose over 16-fold, from 13 cars per 1,000 people to 217. With new cars (and, equally important for a long time, new bicycles) came a rising “Good Roads Movement,” calling for greatly expanded investment in roads at all levels of government. Before World War I, roads were entirely state- and local-government responsibilities (President Andrew Jackson famously vetoed Federal funding for roads, a precedent followed for most of the 19th century). But by 1916, with the expansion of free rural delivery by the postal service and booming agricultural production (as well as the specter of logistical demands if the United States became involved in World War I), a real constituency for public investments in roads was formed. Progressives seeking modernization, military officers concerned about military mobility, and farmers wanting free postal delivery and access to urban markets all aligned together, and the Federal Aid Road Act of 1916 was born. The Road Act of 1916 required that every state have a highway department managed by engineering experts, and allocated federal funds based on postal service needs and population. But states could access those allotted funds only if they submitted plans for rural road development and matched Federal funds dollar for dollar. Moreover, roads were required to be public access, meaning that tolling was prohibited. This plan led to many roads connecting rural areas to urban centers, but virtually no roads between major cities. The long-distance travel situation was so bad that when future President Dwight D. Eisenhower participated in a military “Transcontinental Motor Convoy” in 1919 to assess the nation’s roads, it took 65 days to get from Washington, DC to San Francisco. Several vehicles did not survive the journey, a number of soldiers were wounded, and over 80 bridges broke or collapsed. In response to these “motor convoy” escapades, Congress passed the Federal Highway Act of 1921 which established a national highway plan intended to ease long-distance, and especially military-related, travel. This act established a national map of roads to connect major urban centers, and became the blueprint for the future US Route system and eventually much of the interstate highway system. Thus, by the early 1920s, states faced a growing constituency of largely urban drivers wanting urban roads and federal willingness to match state spending on rural roads and roads between major urban centers, but no good funding source. No state had a broad-based sales tax, and relatively few had income taxes, as we’ve shown in previous maps, while traditional road-financing tools like tolls were restricted. Thus, states made the reasonable choice of taxing motorists to generate matching funds to get federal grants. The nature of federal matching funds also explains why some states fell in line before others. States with large, isolated, rural populations and strong farm- and progressive-interests, like North Dakota, Kentucky, Colorado, and Oregon, stood to benefit from federal rural road investments, and so rapidly did what was necessary to get matching funds, even before the 1921 act expanded federal subsidies to roads between cities. But states with major urban clusters like Illinois, New York, New Jersey, and Massachusetts took longer to pass gas taxes because their main need for road funding was for urban roads, which the Federal government would not subsidize. By 1932, the Federal government had implemented a gas tax of its own to finance New Deal public works and road-building projects. Under various names and agencies, the Federal government largely assumed direct control of many road-building projects, and a much larger funding role. Ever since then, Federal involvement in roads has remained prominent, and gas taxes have provided the largest single revenue source, while tolling and other user fees remain less common and are often restricted. Read more on transportation taxes here. Follow Lyman and Richard on Twitter.